So I'd never eaten at St Ali until 2 months ago when my housemates and I decided to try it out after our forage through the South Melbourne market. 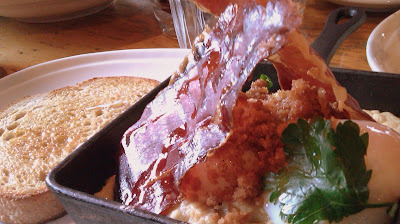 I'd never wanted to eat at St Ali before because I'd heard that the food was generally overpriced and overrated. Harsh. Sigh. Life is tough sometimes. My housemate's mom, who had joined us for brunch, ordered the syphon coffee - I must say, for a person who really isn't into this whole scene, it's a pretty cool concept. Watching how it was brewed and passed through the filter using a siphon made me really miss my chemistry lab classes. Nerd much? Secret recipe corn fritters - so light and fluffy and corny (they are made of corn after all) on the inside and crispy deep-fried goodness on the outside. The beauty of it almost brought me to tears.. 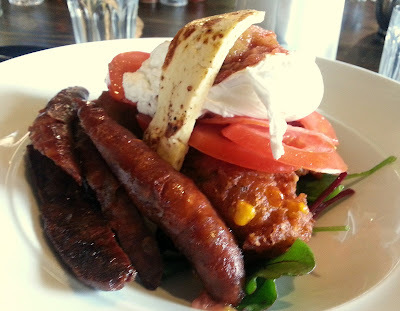 Topped with fresh tomato, salad leaves, grilled haloumi & kasundi (tomato relish) with poached eggs, and not forgetting the awesome chorizo on the side. Guys, if you only have one chance to check-out St Ali, THIS is the dish you want to be ordering. Trust me - you won't regret it. The service was your regular hipster-style experience (i.e. more cool than warm). The ambience was great - giant warehouse, lots of natural sunlight, lively brunch crowd - you really can't ask for more. Defs worth checking out. Mind you, expect to be around $25 poorer at the end of it.